The CRP-10533 door features a double bead on the inside framing bead, which gives it just the right amount of design to be interesting, but not too much that it becomes ‘busy’. If you wish to customize this door, then select an outside edge profile from the available list. 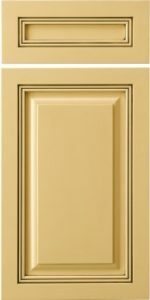 To improve this door specifically for painted finishes, Conestoga (CWS) unveiled the CRP-10533 (MDF), whose features include full MDF construction, five-piece miter joints, and a raised center panel.